The Belgian GP of 1960 was one of the most disastrous races in Formula 1 history with the weekend claiming two drivers and two others suffering serious injuries in practice. There were two big accidents on Friday with Moss suffering an axle failure and being thrown from the car in the ensuing crash. He broke both his legs. Formula 1 debutante Mike Taylor suffered a steering failure in his Lotus and crashed into trees beside the track suffering multiple injuries which ended his career. 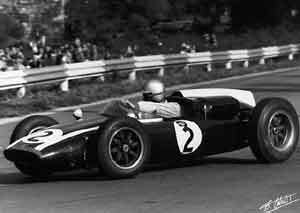 Jack Brabham took pole position for Cooper, two and a half seconds faster than the older BRP-run Cooper of Tony Brooks with Phil Hill's Ferrari sharing the front row. Behind them were the BRP Cooper of local hero Olivier Gendebien and Graham Hill's BRM. The race would be a disaster. Brabham took the lead at the start. He would lead from start to finish. Gendebien made a good start to be second but then faded, while Team Lotus's Innes Ireland moved up into second place, although he would disappear soon afterwards with clutch trouble. On lap 17 BRP Cooper driver Chris Bristow, who was fighting for sixth with the Ferrari of Willy Mairesse, lost control at Malmedy and crashed. He was thrown from the car and killed. Within five laps Alan Stacey of Team Lotus was also dead, having been hit in the face by a bird near Masta. He crashed, was thrown from his car and killed. Brabham won the race while Bruce McLaren in the second works Cooper emerged to finish second, giving the company a 1-2 finish with Graham Hill third but celebrations were muted. It would remain the blackest weekend in World Championship history until Imola in 1994.